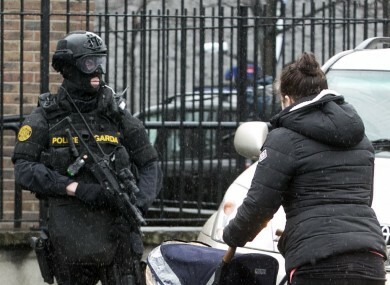 THE PROVISION OF a dedicated armed support unit in Dublin has been hailed by garda management and the Minister for Justice as a success in cracking down on gangland violence in the city. Speaking at the annual conference for the Association of Garda Superintendents this evening, Minister Frances Fitzgerald said the “evil scourge of gang-related crime is being met head-on”. “There have been a large number of arrests and charges have brought in connection with the recent shootings and for related offences. Large numbers of firearms have been seized. Over 11,000 lines of enquiry conducted. In excess of 25,000 high visibility checkpoints have been implemented. The minister also spoke of the success of the dedicated armed support unit for the Dublin Metropolitan Region, which operates on a 24/7 basis. Though this unit has been working in the city since the fatal shooting of Kinahan gang member David Byrne at the Regency Hotel, it was launched formally as a dedicated unit in December last year with 55 armed officers. Deputy Garda Commissioner John Twomey, who also spoke at the conference today, told reporters that 25 lives have been “saved directly” by the intervention of this unit over the year it has been in operation in Dublin. “Some was preventative checkpoints to protect communities. Other [operations] went as far as preventing crime from being committed and saving lives,” he said. Email “'They've saved lives': Dublin's armed garda unit faced 248 'serious incidents' in three months”. Feedback on “'They've saved lives': Dublin's armed garda unit faced 248 'serious incidents' in three months”.